From the Theatrum Orbis Terrarum, Latin text. An exceptionally rare map of Great Britain and Ireland by Jan Baptist Vrients (1552-1612). The full title: ANGLIAE ET HIBERNIAE ACCURATA DESCRIPTIO, VETERIBUS ET RECENTIORIBUS NOMINIBUS ILLUSTRATA: ET AD D.GULIEL.CAMDENI BRITIANIUM. The title translates as: "An accurate depiction of England and Ireland, enriched with ancient and modern names, and approved by William Camden of Britain. With ancient names placed before or after." William Camden was one of England's foremost scholars and historians during the reigns of Queen Elizabeth and King James. Jan Baptist Vrients of Antwerp acquired the rights to publication of the Theatrum after Ortelius' death and went on to publish further editions including maps of his own. It has been estimated that there were only 1650 copies of this map printed and currently fewer than 17 are now in loose circulation. The cartouche in the upper right: PROGENIES REGUM ANGLIAE AB GUILELMI CONQUEST.TEMPORIBUS USQUE AD HUNC DIEM. Anno Dm. 1605 translates as "Pedigree of British kings from William the Conqueror to the present day, in the year of our Lord 1605". Below this is a genealogical tree starting at the bottom with William the Conqueror in 1066 and rising to King James 1603 at the top. The cartouche in the lower left corner depicts a legend of 52 shires with their characteristics in 10 columns. The map is generally in excellent condition after nearly 400 years. The paper is heavy, strong and stable with its full original colours of yellow, pink, green, blue, brown and orange. The engravings are of a high quality depicting galleons, a sea monster, a mermaid and Neptune. The features of the land and coastal points are finely detailed. The map does show some age toning throughout and some damp staining is visible in the lower left and upper left corners. There is an early expert repair to a 2 1/2" separation in the lower fold which is hardly noticeable from the front. There are 3 small pin holes visible (but without losses) - two in the area of Wales and one in the sail of the lower galleon. There have been some small losses to the margin and to the border tip in the extreme upper left corner. On the whole, these slight flaws do not detract from the overall effect of the map. The colors are bright, the paper is sound and the engraving is outstanding. The margins are 5mm all around. 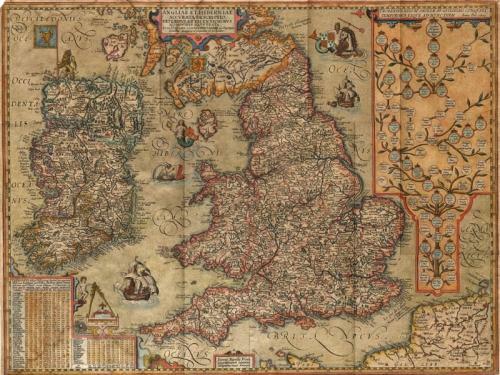 This is one of the most decorative and rare maps of England. Van den Broecke 17 state 2.